On March 28th, one of the great characters of vertebrate paleontology Demberel Dashzeveg, died in Mongolia. Dash was born in 1936 and spent much of his live exploring the Gobi Desert in search of fossils. My exposure to Dash mostly involved dealing with some of the challenges associated with his annual visits to New York which were always... interesting. I will say no more, except that he will certainly be missed. RIP, Dash. In an earlier post, I talked about the prospects for a major effort to moblilize collections data through large scale digitization of natural history collections. This week I'm off to the second major meeting that I've attending on this topic in the last month, which I think could be described as "momentum" - it does look rather like this initiative may happen. This is a good thing for our profession - capturing more of this information in a digital form and making it more widely available opens doors to use collections in new ways, some of which we may not even appreciate yet. My major concern, expressed back in March, was that this proposal would be driven by the people that use the data, rather than those who manage and generate it - there are significant challenges to increasing the rate and scope of data-capture, many of which are discipline specific, and blind application of tecnology may not always work. I expanded on this in a post made to the DIGIT blog on behalf of SPNHC, which you can read here if you're interested. At the last meeting the view that we need to understand collections processes better if we are to automate them seemed to be gaining some traction - here's hoping. Back in the fall of last, I agreed to give a talk to the Peabody Museum's O.C. Marsh Fellows. When I was asked about the likely date, I airily said "Oh, some time in April would by fine." Well, April is here and the talk is not quite written yet and frankly I'm in a bit of a panic. Fortunately, I have a rich vein of material to draw from relating to the sometimes fraught relationship between the Peabody and my old stomping ground of AMNH. Histories of vertebrate paleontology at Yale tends to dwell heavily on the feuding between Marsh and Edward Drinker Cope, but I actually find the later stages of this conflict, involving AMNH's megalomaniacal president Henry Fairfield Osborn, even more fascinating. AMNH curator Ned Colbert used to describe HFO as "one of the most unpleasant people I ever met," and in truth it's hard to find much to like. At a personal level, he was insufferably pompous - he used to require underlings to vacate the museum's elevator cars so that he could ride in solitude and he once stopped George Gaylord Simpson from blotting his signature on a letter with the injunction "never blot a great man's signature." It seems almost gratuitous to note that he was also a die-hard racist and a great admirer of Adolf Hitler. 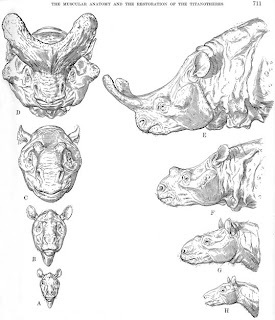 One of the last great works of Marsh's life was to be a monographic account of the evolution of the brontotheres - giant, extinct perissodactyls from the Eocene of North America and Asia. It's likely that Marsh, as one of America's earliest adopters and proponents of the theory of evolution through natural selection, would have approached this task from an explicitly Darwinian perspective. But Marsh died with the USGS-funded monograph incomplete. Enter Osborn, who used his influence at USGS to wrest control of the monograph project from Yale. He then spent the next 30 years trying to use brontotheres (or, as he preferred, titanotheres) to demonstrate his own bizarre ideas about evolution, shaped by the influence of his neo-Lamarckian mentor, Cope. In Osborn's view, natural selection was only a small part of the evolutionary process, which also encompassed elements of predestination and the capacity of species to draw on vaguely defined "inner resources" to better themselves. Osborn spent much of his career promoting this twaddle, and in the process turning paleontology into the eccentric old uncle of the biological sciences. It seemed like all the answers to evolutionary questions would be found in the emerging fields of genetics and population biology and it wasn't until Osborn's succesor, George Gaylord Simpson, published Tempo and Mode in Evolution (1944) that paleontology regained its stature as one of the pillars of the Neo-Darwinian Synthesis. One could argue that Cope's influence on Osborn and the latter's prolonged dalliance with semi-mystical pseudoscience was one of the most damaging aspects of the Cope/Marsh quarrel. This is not to say that the sheer weight of effort that Osborn threw into promoting his theories was wasted. In his desire to counter the influence of the experimental biologists, he oversaw the creation of the massive vertebrate paleontology collections at AMNH, which remain an unparalleled resource for scientists today. His brontothere monograph, The Titanotheres of Ancient Wyoming, Dakota and Nebraska (1929), and its even weightier successor, Proboscidea : a monograph of the discovery, evolution, migration and extinction of the mastodonts and elephants of the world (1936, 1942), are magnificent fusions of art and science on a scale unlikely to be undertaken again. Neither of these works was published in any great numbers and copies are rare and expensive - a quick search of Abebooks turned up three copies of the 2-volume Proboscidea monograph, ranging from around $3,500 to nearly $6,000 - but you don't need to mortgage your house to look at them. Both monographs have been scanned and uploaded to the Internet Archive and can be downloaded as PDFs as follows: Titanotheres Volume 1 and Volume 2; Proboscidea Volume 1 and Volume 2. It's megalomania, but it's glorious megalomania. 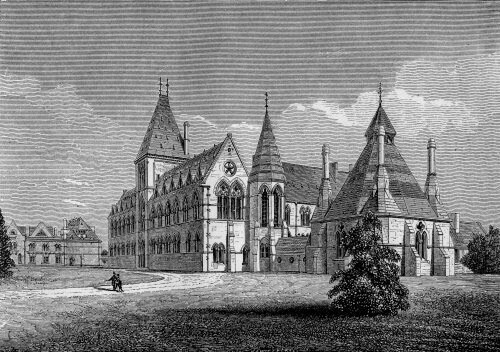 For its 150th anniversary year, the Oxford University Museum of Natural History has acquired a writer in residence. Georgina Ferry, who is an accomplished science writer and journalist, has started a museum blog called Dodology. I have a great fondness for the OUM, which is where I started my museum career, and it's nice to see it getting some exposure in the blogosphere. Boy, am I glad I don't work for the Smithsonian? It seems like every time those guys produce an exhibit, torch- and pitchfork-waving mobs take to the Mall. The latest controversy relates to the National Museum of Natural History's new Human Origins gallery. I'm not going to wade into this one, except to note that if you ever meet the donor in question, remember that his name is pronounced "Coke." We were specially briefed on this when he donated a chunk of money to my alma mater in NYC, which gratefully renamed its dinosaur halls after him. Failure to remember this will place you in the same category as my two favorite newspaper headlines of the 1950s - "Dr Fuchs Off To The Antarctic" and "Dr Fuchs Off Again." Today is the 269th day since my Yale colleagues and I submitted our latest grant proposal and we are still "pending." Pending is now officially my least favorite word. On the plus side, we still haven't been rejected. On the minus side, if we are rejected, we now have less than 100 days to prepare a resubmission. What, me worry? After 4 years, my NSF fossil mammal collection improvement grant at AMNH is coming to end. It probably won't impress the know-nothings at Fox News, but we managed to train 18 student interns, a whole army of volunteers, and we gave the good folks at Delta Designs of Topeka KS over $150K of orders - and you can add to that another $100K of orders that we were able to leverage from AMNH using the grant (this was before the Crash, of course - oh happy days). We built a website on perissodactyl evolution, a project blog, and a Facebook group because this is 2010, Dudes, and if you're not on Facebook you, like, don't exist. More importantly, we rehoused over 66,000 specimens in modern cabinetry (it's sealed! it locks! ); we now know how many Type specimens in the AMNH fossil mammal collection (1,525, if you're interested) because someone has now checked and rehoused each and every one of them in a custom-built mount; we've georeferenced 1,265 specimen localities down to digital latitude and longitude and 1,804 to at least county level (pretty amazing when you consider that most of them only had a locality name when we started); and we've added specimen descriptions to the on-line collection database so that you can actually tell what they are when you seach for them. All of which adds up to a collection that will be around for a lot longer and will be a lot more accessible to users. The NSF project was only part of a much larger project to overhaul the fossil mammal collections at AMNH. It started in 2003 and is still grinding on today under the guidance of my colleagues Jeanne Kelly and Ruth O'Leary; they estimate that it still has at least 2-3 years to go. And that just marks the end of the physical moves and cabinet upgrades. After that comes the specimen rehousing and the data upgrades for the vast majority of the collection that wasn't covered by the grant. Not to mention the 250,000+ specimens that are not yet cataloged and available on-line. I suspect that a lot of people are going to be busy for a long, long time. However, the end of the grant marks the end of my involvement with the project. It's a bit of a poignant moment - 7 years reduced to a single line in a resume. But it was a mess, and I helped make it a bit better. Which is the best you can ever say in collection management.